5km is 3 weeks on Sunday. Speed is relative. Just aim to finish it and set your next goal. Dearest Dino time is not important. Getting out there and getting the job done is what matters. 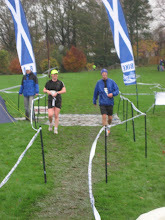 I couldnt tell you any of my finishing times but I can tell you I have been last on more than one occassion. Surely its better to take part in something and say you completed than not attempt it at all. You will be fine, dont worry chick I have faith in you.